You are here: Home / Concrete Services / Concrete Finishing / Your Home: Quality or Quantity? Your home is your investment for you and your family. It holds all the memories of your family. The first step, the first word, the first laugh; it holds many first’s that you would love to share to the next generations. But if your home is not built carefully, would you want to see those memories crumbled down into ashes? If your answer is a big, fat, No – then beforehand, you should consider these factors that might affect you and your family’s home. Before you live on your dream home, you should check if the foundation of your home is durable and resilient to any damages, which might compromise the safety of your home. Or if you have solid RALEIGH CONCRETE as your WHOLE home… Well, it’s pretty hard to burn concrete. We’re just sayin’. If you have ever been interested in building your home completely from concrete, we have experience with them. Installation. This is one of the factors that a homeowner must consider before having a big renovation to their home. They should know if the installation would take long or would be hard. It will really depend on the location of the house and the surroundings of the house. This will help the contractors, especially the homeowner to adjust to the time spent by the contractors when doing the job. Durability. Considering the installation period, does the materials used will last for a long time? This is also a factor to be considered by the homeowner when deciding to renovate his home. Especially on concrete finishing, walls and slabs. The homeowner should really consider the durability of these parts to ensure that the house will stand for a long time. The concrete finishing must not crack easily. The walls and slabs must be positioned correctly and kept in contact. Choices and Aesthetics. There are many different kinds of concrete finishing, walls, and slabs. The homeowner must have a choice on how he would like his home to be. The contractors must provide list of sample aesthetics for the homeowner to choose and provide them with their opinion in connection to that. It can help them to decide in what is the most appropriate concrete service to use in their home. Cracks and Repairs. Later on, if the concrete finishing, walls, or slabs encounters racks or damages, would it be possible to repair it and maybe improve it? This is also a concern of the homeowner with regards to that project. Therefore, the contractors must see to it that if their product encounters damages, they can handle it and control the damage before it gets worse. Cost. Last but not the least, the cost to be spent on this project. The homeowner must be assured that the cost of this project will not burn a hole in their pockets. The contractor also must consider the quality of their products like concrete finishing, walls, and slabs so that if their customers are satisfied with their job, there is a high possibility of referral to other customers that would surely be of great help to the popularity and credibility of their business. Your home is the fruit of your labor – make sure those fruits will not be wasted. 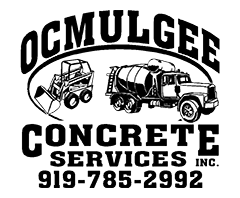 Ocmulgee – pick the best concrete contractors to do the job in Raleigh and throughout North Carolina.